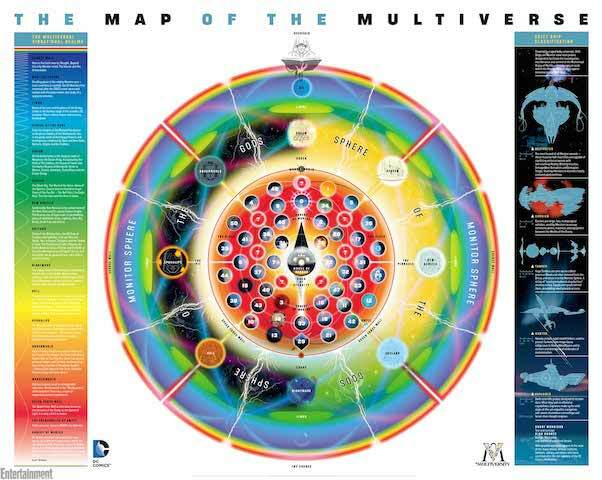 At the recent San Diego Comic-Con, we got some news detailing information about Grant Morrison’s upcoming series “Multiversity,” which promises to take a current look at the DC Comics multiverse. Besides this interview with Morrison giving more details about the series (why can’t that Capt. Marvel book be an actual ongoing? ), attendees at the show also got a guidebook with a map detailing the multiverse. Fortunately for the 99.9% of people that didn’t or couldn’t attend SDCC, Entertainment Weekly‘s republished the map on their website in full size. It looks like in Morrison fashion, he’s really included everything but the kitchen sink (and, unless I missed it, Mr. Mxyzptlk’s Fifth Dimension) in this map. It includes DC’s versions of Heaven and Hell alongside such settings as Apokolips, the Greco-Roman mythological underworld, etc. What are your thoughts on this series or the map? Any aspect of this series that’s raised your interest? For me, Captains Carrot and Marvel, as well as the return of President Obama-as-Superman (and hopefully little connection to the main DC Universe) might be the most interesting things about this. First impressions of "Be Cool, Scooby-Doo"